Passionate Life Seminars - Access books, coaching, and seminars to get your life back on track. Do BAN Affair Recovery Support Groups exist in your city? Yes, if your city is listed below, there is a support group in your area. Contact your local group by clicking on your city, and sending an email to your local coordinator. If you do not receive a reply within 7 days, use our Comments form to let us know. 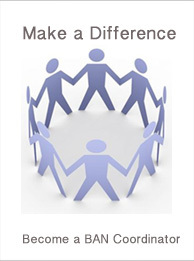 Please keep in mind BAN support groups are run by local volunteers. 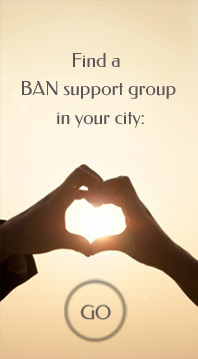 If there is not a BAN group in your immediate area you can e-mail a BAN Coordinator in a nearby city and see when they meet as you may want to drive to attend their meetings or if your city is NOT listed below, see: No BAN Group in my City. ATTENTION MEDIA! DO NOT CONTACT COORDINATORS DIRECTLY! Use Comments form to contact Anne Bercht or call 360-306-3367. We DO want to help you, if your goal is to help people by responsibly educating our world. NOTA: * El arterisco indica que los coordinadores hablan Ingles y Español. Click on any of the cities listed below, and an email will open so you can email your city’s coordinator!